Although the regular light on my Bernina Aurora 440 sewing machine is pretty spectacular, I've noticed that sometimes it's getting harder for me to really see the stitching. Blame it on being middle aged and having the corresponding eyesight. Fortunately I remember seeing a lighting recommendation from Bonnie Hunter of Quiltville fame. She uses the Jansjo light from Ikea. So the last time that I was there I found one and brought it home for the very low price of $10 or so. Last night I set it up and was very impressed with the light. See for yourself. This is with only the general lighting in the room at night. The sewing machine is turned off. This is with just the sewing machine on. Now this is with both the sewing machine light on and the Jansjo light turned on. Do you see the difference? That nice spotlight that I can angle directly at the feed dogs helps tremendously. My eyes already are thanking me and Bonnie too. Now I need to get another one to take with me for classes. If you're ever near Ikea I can say that this is a fantastic buy. Meet my first Bernina - a Bernina Nova 900! I bought her on layaway while I was attending college in Santa Barbara. She's a great little machine ... complete with a carrying case! I made some stuffed bunnies in dresses. My mom still has two of them and I sold three of them to a store on State Street. Of course I highly doubt that I made a profit, but I did manage to walk in and sell them to the manager. My roommate and I were all set to start our own business, In Cahoots. Alas, it didn't take off farther than that initial order. At any rate, I've had an email request for help on cleaning, oiling and threading the Bernina Nova 900. So I've made my first ever video demonstration. Please forgive the quality ... I don't think that I set up my lighting very well, nor do I have that lovely voice-over skill. After taking Ray White's basic sewing machine repair class this July, I didn't have much time to tackle one of the project sewing machines that was waiting in my closet. Earlier this week I took this two-tone White machine out that I found on craigslist. It was made in Japan and I think it's from the 50s or 60s. Most of it is very heavy metal but the blue parts are plastic. After a bit of cleaning, oiling and a conversation with fabric covered pliers (one little knob was so frozen that it had to be gently persuaded to comply with my wishes) I discovered that it was a pretty decent little machine. It zig-zags, does a very nice blind stitch, reverses, drops its feed dogs and makes a beautiful straight stitch. It even came with its original sewing machine manual. Of course there was nothing that could be done about the bobbin winder which fell of the machine! It looked like someone had tried to hot glue it back to the plastic cover! And yes, the case has seen much better days - I think the previous owners could have been a bit more creative with the duct tape, don't you? In addition to the zig-zag foot that came with the machine, I found an open toe foot (very useful for the template sewing used in constructing cloth dolls) and a darning foot for free-motion embroidery (also known as free-motion quilting foot, or hopping foot). Other than a zipper foot these will be all that are needed for a beginner. Tuesday night at doll club I gave it to her. Wow! The smiles and oohing and aahing from the lovely Miss D told me that this machine is going to a good home! Last weekend I spent three days at Ray White's Sewing Machine Repair Workshop learning the basics of sewing machine repair. There were eleven of us with two different goals - half wanted to open sewing machine repair businesses and the rest of us just wanted to know how to repair our antique/vintage sewing machines. I started out working on my Bernina Nova (aka Bernina 900) sewing machine because I knew it already was in fairly good condition. At first I was a little intimidated by opening up the cover to look at the "guts" of it. But by the middle of the second day I was feeling pretty confident that I wasn't going to hurt it as long as I went slowly. For those of you who are wondering who that little doll is, she's Mia Rose who's visiting me from Connecticut as part of the Doll Street Dreamers' travel doll project. We went through all the steps of adjusting timing, tension, replacing worn or broken gears if needed and basically how to logically think through the mechanics of a sewing machine. He even touched on information about sergers and a little bit about foot controls not to mention teaching us how sewing machines work in general. By the middle of the third day I had fixed my Elna Grasshopper (yes, I finally broke down and found one of them from ebay last year ... pictures to follow later). Yay!!! I was so happy that I accomplished that because I never really thought of myself as being mechanical. But low and behold I had managed to get something working and working well. Just wait until you see the little teeny tiny stitches that it does. I think that it'll be a great machine for doll-making! With just a few hours remaining in the workshop, I took out another ebay find - a green Singer 185J machine that wasn't working at all. I couldn't even turn the wheel because it was frozen by all the gummed works. Well after just 20 minutes of cleaning and lubricating it I was able to get it turning and got it to work. I still have to balance the thread tension but once again I was thrilled with that accomplishment. So, the most important thing that I learned is that you really must clean and lubricate your sewing machine often. Sewing machine oil will gum up and turn into varnish if it's allowed to sit still for long periods of time. Instead of sewing machine oil we used a lubricant that was originally designed for bicycles called Tri-Flow. It has a little teflon in it and won't gum up. It also will clean and break down the old varnish. This is how I was able to get the little 185J working again. It was an amazing class! Ray was a fount of information with over 45 years of experience and so willing to share his knowledge with everyone. If you have any interest in learning how to repair sewing machines then this is the class to take. You can also find lots of information from a group of helpful people at the wefixit yahoo group. Our hostess was also quite knowledgeable and has an amazing sewing machine collection. She's a true collector and showed me some of her antique hand cranks. This past weekend I saw what has to be the world's largest sewing machine needle - a larger than life Schmetz size 100 needle. It doesn't look especially large laying on the table, but take a look at this next picture where I'm holding it in my hand. Isn't that amazing?! I spent three days attending a sewing machine repair workshop and learned LOTS - first subject was needles. Schmetz made this as a demonstration model to show all the parts of a needle - the eye, the long groove, the scarf and the flat back. The long groove is where the thread lays in to guide it gently towards the eye. Turn the needle around 180 degrees and you'll find the scarf - that little slightly carved out section. This is where the the thread makes a loop and is captured by the hook in the bobbin area. Finally the flat back is ALWAYS opposite the long groove. Keep in mind that the older needles did not necessarily have this flat back. It's very important to know that the older sewing machine needle system called 15x1 will NOT work in machines from the mid 1970s to the present. So please, if you inherit some sewing machine needles in a case of vintage sewing accessories, do not use them. They could damage your modern sewing machine. Sewing machine needles are so inexpensive that it's not a good place to save money. The standardized sewing machine needle system is the 130/705 and I think that Schmetz makes a superior quality of needle. Just remember to choose the correct needle for the type of thread and fabric that you're sewing. Also change your needles often - every 8 hours of sewing or so. Of course a brand new needle for a new project is never going to be too often. There's more useful information on this post by QuiltersBuzz here. Shown here are the ruffled skirts. I just have to finish the elastic waistband and hemming. I'd rather do that after trying them on the girls to make sure that they're not too long. Oh and the pattern that I was testing for Liesl was a big hit with the girls. Miss L has requested that I make her an outfit in her size, only in blue not pink. I've found a page of reference videos on using sergers that I thought you may find useful if you've never used one before. After poking around a bit I discovered Dawn's sewing blog, The Secret Pocket, and this post about serger basics. I came this close to buying one of these today. It's the Elna #1 or sometimes called the Grasshopper. 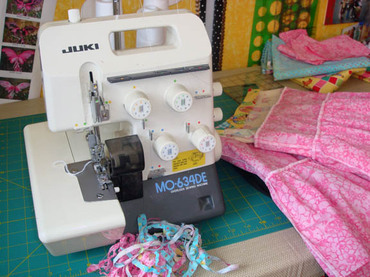 It's a cute portable straight-stitch portable sewing machine with a free arm. The only thing that stopped me from getting it is that this particular one was made for the European market. So it had to be plugged into a big power converter to work. Not the best solution, especially since there were ones made for the American market out there. There's some interesting history behind this machine. It was originally made by Tavaro S.A. - a Swiss company that manufactured arms among other things. 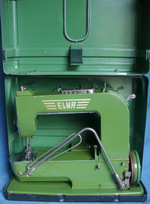 They eventually switched over to sewing machines and became known as Elna. That's definitely a nice swords-into-plowshares kind of story. The coolest thing about this machine is its carrying case. It folds open and becomes a table that the machine slides into. 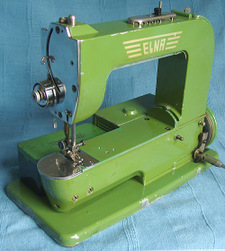 Here's a few links with more information: Elna history, Elna Grasshopper & Supermatic (where the pictures came from), someone's personal Elna. I also tried out a 221 Featherweight. Wow, I have to say that I liked it so much more than the Grasshopper. 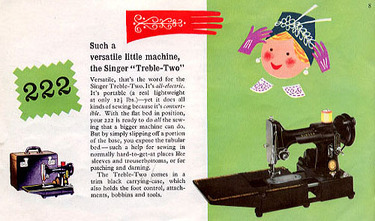 But I still really want the free arm and free motion stitching capabilities of the 222 Featherweight. So perhaps I need to take a lesson from the Shaolin masters of Kung Fu days and have patience. But then again, I did like how cute the little green Grasshopper was. Time will tell what little portable machine I end up with. And on Saturday we had a short visit from my in-laws. We drove directly from the airport and took advantage of the gorgeous weather to show them the Golden Gate bridge. We parked in the lot on the Marin county side and walked to the halfway point of the bridge. The bay was filled with sail boats struggling against the currents and one smallish oil tanker and its accompanying pilot boat. There was one adventurous kayak near the rocks and lots of brown pelicans. (Or at least I think that's what they were .. it was hard to tell for sure since the bridge is fairly high up from the water.) Sadly after lunch at our local Thai restaurant we had just a few hours before we had to ferry our parents back to the airport. Still it was nice to have family visit even though it was a quick one. it's ADORABLE, just look at it! Now I think that I should sell my Juki serger and save money to get one of these beauties. I've only used the serger a couple of times in the last ten years or so. 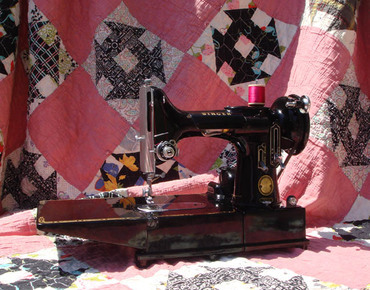 And the featherweight would be ideal for carting to the sewing circles and doll classes that I like to attend. Hmm, I may have to check out thrift stores the next time we're in Ireland or the UK. [EDIT]: I've since been lucky enough to get one of these beauties since this original post. You can read all about it here.